If you or your child was recently vaccinated or are about to be, here are some tips to prepare your body if you have warning, minimize any damage that can occur, and heal from the vaccines. These recommendations are generally regarded as safe for all ages without a doctor’s supervision but if you have complicated medical conditions please see a doctor that will take alternative medicine, detoxification, and vaccine reactions seriously to discuss your options. If you suspect you or your child is currently experiencing a vaccine reaction, click here for an alternate version of this article. If you are no longer vaccinating and it has been a couple months since your or your child’s last vaccine, click here for more comprehensive version of your detox options. Here is what you can do if you or you child is having a vaccine reaction right now. 1.) DO NOT GIVE TYLENOL!! (Sources: article, study). If you already have given it, don’t give any more. Alternative ways to reduce a high fever can be found here. In the weeks leading up to and following vaccination, you do not want to use this pain reliever. 2.) Ice the injection site before and after injection, and continue with cold/ cool showers following vaccination (no cold showers for the very young – use your judgment for an appropriate temp). 3.) Vitamin C, Zinc, Selenium, Folate and B12 for the two weeks before and after vaccination. These vitamins are all water-soluble (excess will be excreted from the body) and assist in the body’s natural detoxing. Deficiencies in some of these vitamins are linked to adverse vaccine reactions. D3 helps recovery also (not water soluble so be aware of daily dosages). You can get all of these from a quality food-based multivitamin like Garden of Life Vitamin Code Kids, Garden of Life Women’s or Garden of Life Men’s. Most cheap multivitamins (pretty much any multivitamin you can buy at Walgreens) have synthetic versions of Folate, and B12 that are not easily processed by the body, so they would actually slow down your body’s processes – the opposite of what you want to achieve. Regarding Vitamin C, many doctors and nutritionists suggest Buffered Vitamin C over ascorbic acid. The product VacciShield (for ages 2 months and up) is an excellent product to boost your body’s natural detox. The ingredients for that product are: Vitamin C, E, D3, Zinc, Selenium, L-Glutamine, and probiotics. (Note that some individual are sensitive to Glutamine and could become irritable, though this is not the norm [it’s related to the GAD1 gene mutation]). Additionally, vaccines deplete Vitamin A, a fat-soluble vitamin which can be replenished through eating chicken, beef, lamb or egg yoke. 4.) High doses of Omega 3 Fish Oil will decrease you or your child’s heightened immune system reaction – which will decrease inflammation in the body and brain following vaccination (sources: here, here, here, here, and a list of studies on brain inflammation here). Be sure to get a brand that filters the mercury out, and has natural (not added synthetic) vitamin A. Vitamin A is important post-vaccination as vaccines can deplete Vitamin A. Some excellent filtered brands that are palatable for kids are Barlean’s Mango Peach Fish Oil, or Nordic Naturals Cod Liver Oil – Children’s Soft Gels (these are tiny and the kids enjoy chewing them), Nordic Naturals liquid, or Baby’s DHA with dropper (2 months of age and up). For adults The Barleans Mango or the Nordic Naturals Ultimate Omega Soft Gels are good brands (my 5 year old will chew the adult soft gels, so they can’t be that bad). Some professionals argue that Cod Liver Oil is superior to any other fish, while a few others suggest Krill Oil for being able to cross the blood brain barrier. And there’s also a large following who swear by fermented cod liver oil such as Green Pastures, though I’m not a follower. 5.) Probiotics. Vaccines contain antibiotics that can kill your body’s natural good bacteria. We know probiotics are linked to the gut and the immune system, so having this in balance is extremely important. Garden of Life Probiotic powder (2 months of age and up) and NOW Foods Probiotic (capsule) are two very good options. Klaire Labs Priobiotic and Klaire Labs (infant) are a little more pricey but has far more varying probiotic strains in them. If your child also suffers from diarrhea following vaccination, it is a common sign of leaky gut. If this is the case, you may want to add BioGaia Probiotic which is known to heal leaky gut and regressive autism symptoms. Do not delay on probiotics if you or your child is showing possible gut issues such as diarrhea, colic, a period of inconsolable crying with no identifiable cause, or intestinal pain in the days following vaccination. 6.) Epsom Salt Baths and Bentonite Clay are generally regarded as safe, gentle detoxes for anyone. Epsom salt baths are the easiest, add one cup to a warm bathtub and get in. Other optional uses for Epsom salt baths here. For bentonite clay, you can simply slab on a mixture of the clay onto the skin and wipe off once it dries, like a facial mask. Or for various other ways to use bentonite clay, go here. Bentonite Clay can be found on Amazon, my personal favorite brand for herbs and spices is Frontier. 7.) Avoid medicines, supplements, and foods that increase inflammation such as fried foods and cooking oils that will increase omega 6 (avocado or coconut oils are better options). Also avoid whey protein and mushroom extracts. Some helpful anti-inflammatory food lists can be found here, here, and here. Foods/ supplements that may help reduce the inflammatory reaction include Curcumin (the active ingredient in Turmeric), and Quercetin. Vitamin E may also help settle down that immune response. If you are being forced to vaccinate, you can read more about this here. If you suspect you or your child is having an adverse reaction, you will want to report it to VAERS. It’s not up to you (or your primary care doctor) to determine what should not be reported, it’s up to the CDC/ FDA that receives these reports to determine what is related, as patterns of reported reactions may emerge, so be sure to report! It takes about five minutes. You do not need any paperwork from your doctor, you simply need the date, brand names, and Lot # (which every doctor or nurse must keep on record). If you do not have this, you can report and VAERS will contact you to obtain additional information later (if it’s available). Even an office assistant should be able to pull it up and provide this information over the phone. And, don’t assume the Pediatrician or ER doctors have already reported it, they almost never do. And in some cases, they refuse to report it. Additionally, we’ve even heard of doctors removing evidence or notes in the file about recent vaccinations. More information on VAERS is available here. 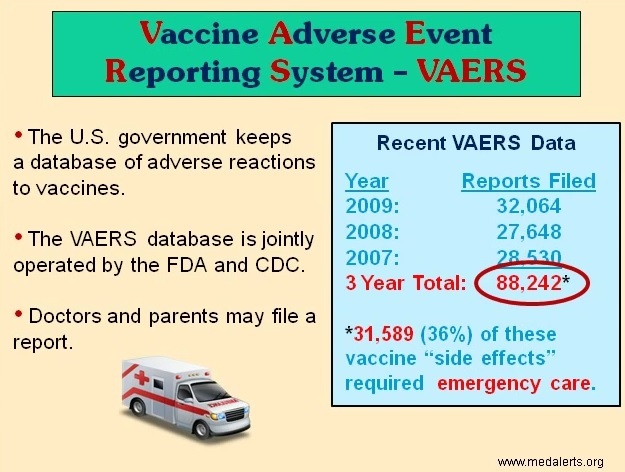 Reporting to VAERS is important, especially if there is evidence of long-term harm that warrants a lawsuit to the Vaccine Injury Compensation Program (VICP). To file in VICP, where all legal fees and costs are covered by the program, the injury must have occurred within two years of injury. If you are breastfeeding, you may consume probiotics, omega 3 fish oil, and vitamins which will pass to your baby through your breastmilk. You do not need to give a breastfed baby probiotics, they are already present in your breastmilk and more may pass to your baby if you take it yourself. Do NOT detox yourself while breastfeeding such a detox drinks, this will remove toxins that are settled in your tissues and likely pass some of it on to your baby. It was once assumed that the placenta filtered toxins out, but scientist are now aware that this is not accurate. For a full Blog Post on options for detox following vaccination: Detoxing From Vaccines. This entry was posted in Uncategorized by Kat. Bookmark the permalink. bookmarking and will be tweeting this to my followers! Fantastic blog and great design and style.